« LolPol with Laura Campbell! Daniel Muggleton is an Australian stand-up comedian currently based in London, UK. Having performed sold-out shows at comedy festivals such as the Edinburgh Fringe, Melbourne International Comedy Festival and Sydney Comedy Festival, Daniel was invited to perform an encore of his 2016 show ‘Let Me Finish’ at The Comedy Store, Sydney. This show was recorded, turned into an album and subsequently released by Grammy Award-Winning US label Comedy Dynamics – their first ever release by an Australian comedian. First and foremost a stand-up, Daniel’s honest and blunt storytelling has made him a fixture at comedy clubs around the world having performed in The UK, USA, Germany, Belgium and his native, Australia. His casual delivery and conversational style meaning no topic is off-limits, with his observations staying just this side of affectionate. Daniel was twice selected as a FRESH Artist To Watch at The Sydney Comedy Festival in 2014 & 2015, and was chosen to perform at The Break Out Showcase & Showcase Tour in 2017. 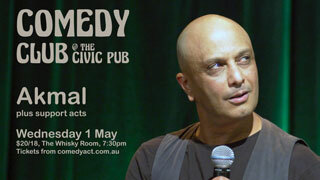 He’s also been hand-picked as tour support for Alex Williamson, Neel Kolhatkar & Steve Hofstetter. Off the comedy stage, Daniel has appeared on Australian television on The Feed (SBS) and The Checkout (ABC). He has also written for A Rational Fear (FBi) and web series SYD2030.